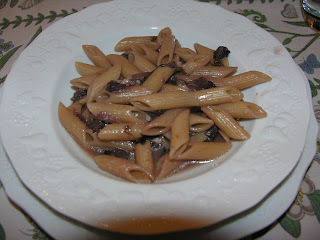 We ate this dish at my friend Luciana’s in Roma! It’s light and fast to make, and easy on the palate. A lovely spring and summer dish. Wilt the washed, drained, and sliced radicchio in heavy fry pan awash in olive oil, (5-6 tablespoons) minced onion and pressed garlic–as much as you like of everything! I usually use a small sweet onion, preferable Vidalia, and 3 fat cloves of garlic and hot pepper for two heads of radicchio. When wilted, add a glass of white wine–whatever your drinking works well! When the alcohol burns off add about a 1/2 glass of heavy cream and stir. When slightly thickened, remove from heat and toss with the penne–sprinkle with grated cheese to amalgamate the whole dish. Add fresh coarse ground pepper if desired.